Mollie Cunningham from Killyleagh, is celebrating success after winning three top awards at the Ulster University Business School. Mollie (pictured), who recently graduated with a BSC Hons degree in Consumer Management and Food Innovation recorded the hat trick at the annual Department of Hospitality and Tourism Awards held at the Coleraine Campus. Her awards included the Suki Tea Food Policy Award for achieving the highest mark in the Contemporary Food Policy module; the Food Innovation Award for high level performance in the Food Innovation module; and the Consumer Council (NI) Award for excelling in the Consumer Issues module. Erica Cleary, from Drogheda, has also been honoured with a top award from Ulster University Business School. 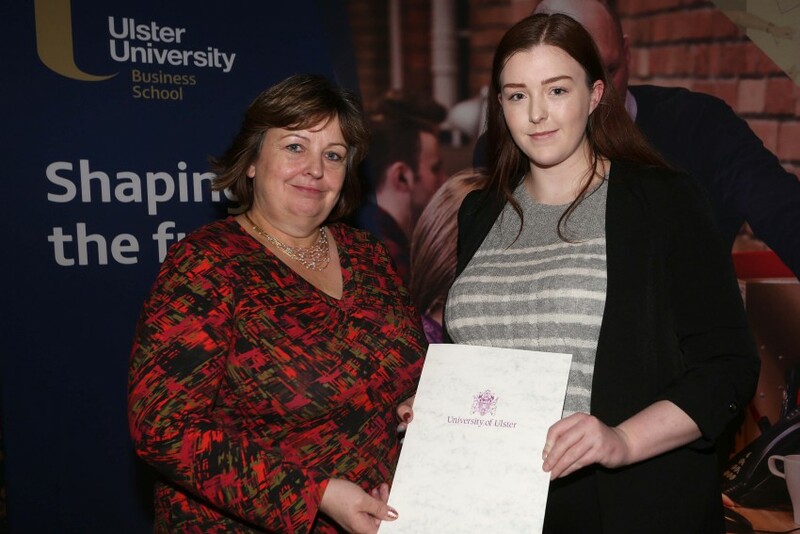 Erica who is studying for a BSc (Hons) degree in International Hospitality Management was awarded the Miles for Matty Scholarship at the annual Department of Hospitality and Tourism Awards. Erica Cleary is presented with the inaugural Miles for Matty Scholarship by Professor Julie Hastings, Hastings Hotels Group. The Miles for Matty Scholarship was set up in memory of Matthew Drumm, a very popular and hard-working student who also pursued the part-time International Hospitality Management course and sadly died on Christmas Eve in 2013. His full-time job was with the Hastings Hotels Group in the Europa Hotel. A total of 15 major awards were presented. Sponsors included Hastings Hotels, Belfast City Council, Belfast Titanic Hotel, Crosskeys, Consumer Council (NI), da Vinci’s Hotel, Henderson Food Service, Northern Area CIMA, Suki Tea, Tourism NI, Origin Digital, Special Olympics, Bank of Ireland.